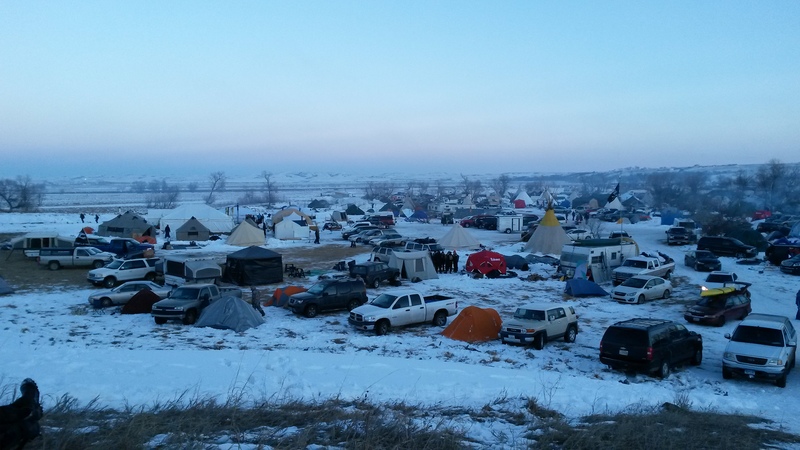 Five days at Standing Rock were like five days in another world. I arrived after the first blizzard, survived the second and left before the third. Trying to find words: ordinary life seems unimportant – and lonely. I went because I had to be part of it. This is the most important thing happening in my lifetime. A friend said “Really? You lived through the Civil Rights era and women’s liberation.” I said, “Yes.” But why? There have been lots of pipelines before, and lots of battles. Most Important: This is the place where the forces of life stood up to the forces of death for profit. Death for profit: pipelines spill eventually, causing sickness and death nearby and downstream. Fossil fuels create climate change. It’s all about destroying life for profit, made from our addiction to temporary conveniences like cars. The forces of life: we can’t live without water.“Water is Life” or “Mni Wiconi” is the slogan. Also, this movement is in the hands of a people who live by the earth, who lived thousands of years in this place without ruining it, who honor and respect every living thing as relatives. Here they stand up for their way of life, resisting a culture that is exactly the opposite: natural things and living beings including people are seen as resources for exploitation for profit. This is deeper than any of the other issues of my lifetime – even though the others bleed more vigorously. It is the battle between industrial civilization and the Earth herself. Camp was the place where people understood this – where the community understood it. Morning Prayers: Mornings, I woke (cold) to the voice of a singer. He sang for over an hour, without faltering. I crawled out of my sleeping bag into winter clothes and went to the sacred fire. There were lots of people. There was smudging, more than once, and prayers by leaders, and songs – most but not all by men. Chanting sometimes. Memory already fails me. Walking again, when I approach the hill down to the river there are lines of men, holding out their hands so we don’t fall on the slippery rough steps. The first time I thought “I can do it myself.” After, I felt the gift of community. Men help women. (Later we took our turn in helping them walk down to the river.) The lines split in two, and each led to the river. One at a time we offered tobacco and said whatever prayers we had – then stepped away from the river and waited. When all were done, there were songs, prayers, and chanting. Mni Wiconi, Water Is Life, Agua Vita, every language that someone knew. Call and response. I only had sign language to offer, but a leader saw my offering and led the group, raising her hands high to be seen so we could all say “water – life” in American Sign Language. It was a very long ceremony. I wrapped up as well as I could, and came away chilled. The men – most had bare faces, some bare heads, and more than imaginable, bare hands. The sacrifice! Learning something about sacrifice, heart opening. I looked into every face, looked into the eyes, grasped every hand as long as possible, taking them in. When hand were bare I cupped them, as long as I could, until it was time to move on. Just remembering, my heart opens again. The eyes, the hands, the community, the support. This is how we are together. 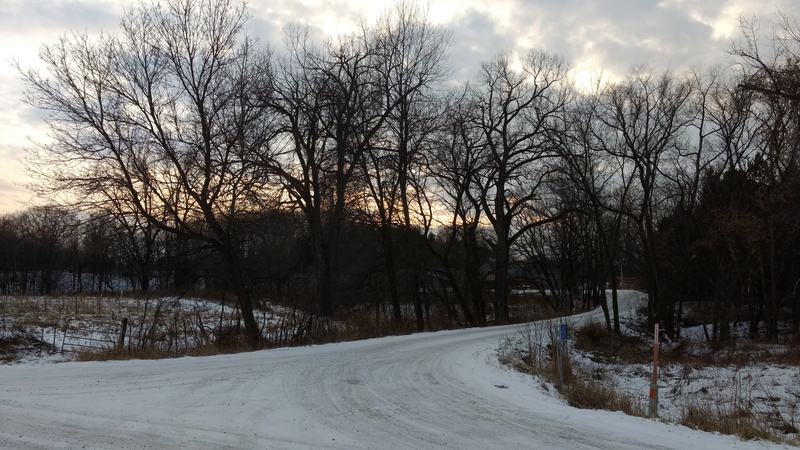 The thought came up: This is why I am here – to pray by the river in community. Friday, Saturday, Sunday, Monday – Four times I was there. 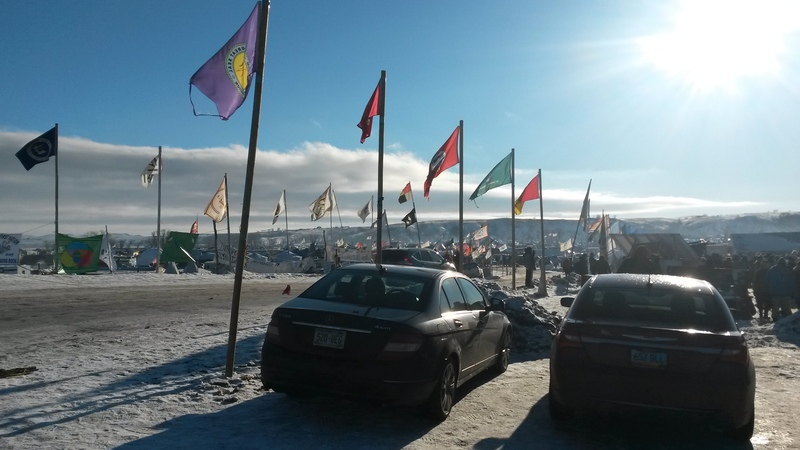 On Tuesday we were still in the blizzard, I could not bring myself out of the tent, and I hear that almost nobody made it to the sacred fire for prayers. On Wednesday I had gone up to the casino, to be ready for my ride. Superb organization: Although everything was confusing and difficult, the organization was magnificent. You just had to keep asking for help or directions, and accept not knowing everything. My first morning I went to the mandatory orientation, about 2 hours, and was informed and encouraged by three women of different backgrounds teaching us how to be here. The volunteer tent was a constant source of information and help. The medic tent, besides healing teas and hand warmers, offered conventional and herbal healing, counseling, and a warming tent – where I finally fled one day. I thought I would volunteer with the medics, but newcomers don’t do that – which completely makes sense. I did a few hours of useful work, but mostly just managed not to be a burden. I ate at two different kitchens, both with incredible food and generosity. There were a lot of yurts, some donated or loaned, and construction crews were building more, and tipis with wood stoves. All the group spaces – kitchens, meeting tents, and the like – were warm sleeping spaces during the blizzard and after. During the blizzard, medics checked every tent and checked for needs – hypothermia, propane, whatever. 32 people were evacuated for hypothermia – none died, no permanent injuries. The emergency backup place was the casino, and the Cannonball Rec Center offered showers as well. A lot of people went to the casino in the cold; camp kitchens brought food and served meals up there. Without central organization, somehow things worked. There were propane deliveries. When I asked for a second sleeping bag, they handed me one, and a stranger got me two little propane bottles on hearing our worries of running out. Handwarmers and hot tea were available everywhere. Hats, gloves, coats, and more – tents were full of warm clothing for anyone in need. There were countless meetings and trainings: orientation, action meeting, action training, decolonization (in various configurations), women, and then emotional wellness meetings in the medic area. Not to mention task meetings that didn’t even make the public lists. Plans changed often. Veterans and December 4: Four thousand veterans gathered for a nonviolent action on Sunday, December 4. The energy was strong. They mobilized, built barracks and other spaces, set up a command post – without seeing much, I could sense their confidence and experience. In individual conversations, I repeatedly heard a strong commitment – this was just their duty in defense of their country. Many were indigenous, many not. The faith leaders were there as well, I have no idea how many. And chaplains, housed in a church space and with their own mission. I was grateful to be living in camp even though those groups had warmth and hot water. There was a very long interfaith prayer service, with prayers or songs offered by every tribe and every denomination present. Then we were told to make a big prayer circle, surrounding the camp – while the veterans went to the bridge, the place where our people met the police. But word came around that the Army Corps had rejected the permit and we had won. There was a lot of disbelief, concern this was a distraction to prevent anything interesting from happening with the veterans. The elders called the veterans back from the bridge; they returned Monday and stood guard while indigenous groups did ceremony – the opposite of their role in past wars. For some veterans, it was a healing of what they had done before. There was a forgiveness ceremony about that. And at the end, Tuesday, a long ceremony involving giving an eagle feather to each one of them. They were expected to leave after four days, but some committed to staying until the drill pad is gone. Culture: As an elder, I was regularly pushed to the front of the food line, sat down and brought a plate of food. The time I tried to offer my fireside seat to the head cook who must have been exhausted, she refused, saying “You’ve been working all your life.” It makes me weep. I’m also in awe of the middle-aged and young people who go on and on, working long hours in the cold and then working more. Their stamina and their dedication. And I came to appreciate men – the whole time, the men showed up to do heavy lifting, work in the cold, use their skills as mechanics or carpenters or whatever – and then be last in the food line. There’s a dim memory of that from my early life, but nothing so physical. What must life be like when men take that responsibility WHILE cross-gender and Two-Spirit roles are also honored? What kind of home is this? Kindness! My story, and Buddhists: I came to be part of a Zen Peacemaker Order retreat. After a day of searching I found some of the people in it, and was offered a bed in an RV which I gladly accepted. (This might tell you what it’s like to be in a camp of 10,000 people.) By the time the leader came, I had made connection with Buddhist Mylo Burn, who was living in a large dome tent, hosting zazen three times a day, and sharing the space with Buddhist Peace Fellowship (gone now), small meetings, and several people who slept there. I moved into the dome tent. I also agreed to lead half-day retreats on two days, meaning I would miss community events but it was a joy to sit together. And a result was that my connection with the Zen Peacemaker group was minimal – and then they left December 5 before the blizzard. Then we were there in the tent, trying not to use up the propane in case there wouldn’t be any more deliveries. On Sunday, when they were creating the giant circle of prayer, I got separated from the group. I went down to pray by the river, which I’d wanted to do again. When I was ready, I found the group and joined the circle. That was a wonderful mistake. A few regrets: being there such a short time, and being confused so much. A regular volunteer job would have helped, and then I would have been of use as well. If I come back, I’ll stay longer and be better prepared. I don’t yet know whether my best work is here or there. The sacred fire at Oceti Sakowin was put out Saturday afternoon, by order of the elders council. I learned that night, and was distraught. It felt like an abandonment of the thriving beautiful community where I lived for five days, and of the core of dedicated people who kept camp running through the blizzard, who checked every tent to see who needed help, who gave out hats, sleeping bags, blankets and propane with more than joy. They re-lit it a few days later, renamed the camp Oceti Oyate or The People’s Camp. Things are evolving. I re-united with Jenny, who I came with; we helped take down the camper where she’d been staying (with help from men again), and then drove out through blowing snow and bad visibility, staying on the road and checking visually to make sure nobody was in the vehicles in the ditches. We got to her house at midnight, moved my things into my car, and I drove home, grateful that my driveway was clear. I turned up the heat and water heater and waited to take a very long hot bath – wanted for a week – before going to bed. Like everyone, I was sick for a few days – just a cold – and am still chilled a week later. Slowly returning to everyday life – with new responsibilities, details to be clarified, local allies to work with. After: We were told to evacuate. There were several meanings: First, children, elders, and others not able to handle the weather need to go, so the camp can continue. Second, we won so we can go home now. (This is not a common opinion.) Third, leave now and come back when needed again. There’s a question what the “victory” of no permit actually means. Is it a real victory, or a distraction? 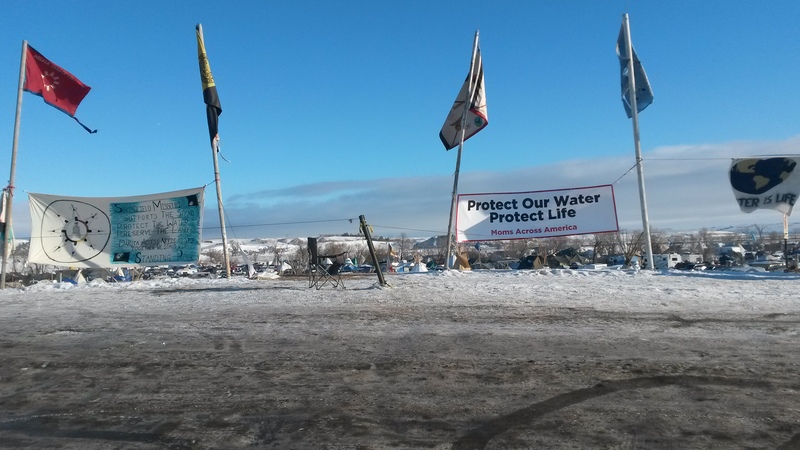 On January 1 DAPL’s contracts become void – will this destroy the pipeline, or will new contracts be signed? Obama kept talking of a new route, which protects the tribe but not the climate or the river. DAPL insists on the present route, is continuing to drill, and says they will drill anyway in spite of fines. Whether weather might delay the drilling, we don’t know. Of many responses I share these: Wallace Chase: “They will say: This is where it started….the saving of humanity.” Margo L Kellar: “People got woke and will stay woke now. This is just the beginning.” My response: They will say that the people of the earth stood up to the industrial greed-machine, to the black snake. They will say that millions of people around the world came forward to help in every way they could. They will say that this was the beginning of the end of the greed-machine and the beginning of the return to harmony with the earth, with the spirits, with our own humanity. They will say that prayer and love were more powerful than violence. They will remember that indigenous people took the lead, made the sacrifices, and that others followed. Our great-grandchildren will thank us for this time. I close with some words from indigenous people, our leaders in this time of healing and change. “500-1000 people are still at what was formerly known as Oceti Sakowin Camp, even though this particular sacred fire has been extinguished today by those individuals who created it. Stay if you feel in your heart that freedom is here. We may never get this opportunity for another generation. When I first saw people coming in to stand against Dakota Access pipeline on the April 1st at Grand River Casino I was overwhelmed with thankfulness, the youth runners, women and children walkers, horse riders, Biker riders and the Seven Council fires. They came to stand with us and what is seen in July made me cry for days as the people of the world came to stand with us. As we stood with people of the world I felt a healing of the land and then… we were attacked. I was shocked at the behavior of the state against peaceful people. The people still stood against the violence in prayer, song and dance. We stood with our many cultures united we stood is laughter and story telling, in the morning you can hear the songs across the camps. As some people get ready to leave the camp because of the weather we know that they carry us in our hearts. I pray they carry the lesson of the camps to where ever they live. It is time to change the world thought. We can live with our earth in respect and honor by learning to stop fossil fuels and start using green energy. Let’s change the world by protecting the water everywhere. Good evening everyone Chase group and Sacred Stone group spent the day gathering supplies for the camp from SRST [Standing Rock Sioux Tribe] building I found all our generators which make me happy so bring them down to camp. The solar panel and batteries were there too. So happy. I found the army tents too. Getting all these to the camp and give them out to people tomorrow. Our lives have changed so much since April 1st. It has been eight months and 12 days since the camp opened. I remember those who stood that first day was Joye Braun, Joseph White Eyes, Wiyaka Eagleman, Happy, Jocelyn Charger, Allen Flying By, Antoine American Horse, Alfred and Swans, Faith Spotted Eagle, Virgil Taken Alive, Prairie, Elizabeth from Cheyenne River and her daughter who carried the water to bless the ground and all the Oceti horse riders on that cold day. It was those who stayed that first cold week when everything started at Sacred Stone. I am honored by them who show us how to build a camp which was Joye Braun, Paula Antoine, Cheryl Angel, Wiyaka Eagleman, Joseph White Eyes, and Antoine American Horse and family. These was no one that started this movement it was a coalition of people, there was the Chairman who informed the community of the Pipeline, there was a group in South Dakota Honorata Defender, Virgil Taken Alive, Jon Edwards, Dustin Thomspson, Josephine Thunder Shield, and other in their group just to name few, then there was the Wakpala group Bobby Jean Three Leggs, Waniya Locke, and many of the youth who stood up to run for the water. The horse riders, the bike rider, the walkers and runners. The movement for the water really started with the youth who first put the words out though video and live stream and Facebook, twitter, and other social media, as the chairman understood it was their words the world would hear. In my own opinion this movement was a collection of people who understood that we must make a stand we had all those who fought XL Pipeline to show us the way and help with advice, then so honored to have Honor The Earth people and Winona Laduke to support and help us, they did fund rising for us, then EIN who came in to help too both with grants and training, then Moccasins on the Ground Deb White Plume to help with training, Tanya Warriors Women, Jim Northrup, Bill from Portland, Wild Bill Left Hand and so many others who were on the ground before July, so many more names that were there but my point is this movement was by any people that everyone should be given credit. This is a world movement so this includes every walk of life, it is not about which race, color or religious belief you are, it is about changing the world to save the water. Plain and simple stand up for water. We stand up for life. Most of all everyone continue to put down tobacco for the water and prayer ceremonies for the water. Remember why we are here to stand up for the water, to stand up for our people, to stand up for the healing of the people.